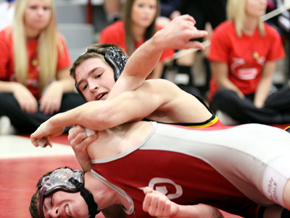 It’s always nice to perform at home, but the level of competition in the Boone Central Invitational wrestling meet still presents a difficult challenge, even for the host Cardinals. The 2010-11 learning curve for an inexperienced Boone Central team continued this past Saturday against some of the top-rated teams and individuals in Nebraska high school wrestling. The Cardinals, missing several varsity competitors due to various ailments, finished 10th in the team standings of the tournament won by Class A powerhouse Kearney. Four Boone Central wrestlers earned medals, with brothers Jacob and Jackson Meyer producing the top results for the Cards with fourth-place efforts. “Our tournament once again featured many state-rated individuals and teams from Classes A through D. There were many great matches and our wrestling club did an excellent job putting on a classy tournament,” said Boone Central Coach Dale Bonge. “We did not perform as well as we expected to, or as well as we have the past few weeks,” Bonge opined. “The level of competition had something to do with that, but we are still far from satisfied with our results overall. Along with the two fourth-place finishes by the Meyer brothers, Bobby Stopak and Scott Joe each finished sixth for the Cardinals. Bonge said Jake and Jackson share this week’s ‘Wrestler of the Meet’ honors. “Jake’s only two losses were at the hands of wrestlers rated 3rd and 4th in Classes A and C, respectively. He had dominant wins in his other matches,” Bonge noted. “Similar story for Jackson, who lost to guys rated 1st and 3rd in Classes A and D and pinned his man in his other match.